This is another picture from our trip yesterday. A few weeks ago the bulbs were poppin’, and now the wildflowers are starting, so Spring can’t be too far away. 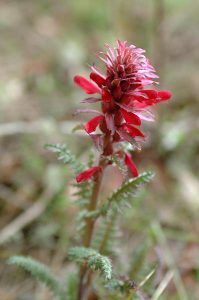 This interesting wildflower is called Indian Warrior (Pedicularis densiflora). The leafs and base of the plant look like a fern, but then it has this very bright red flower stalk.